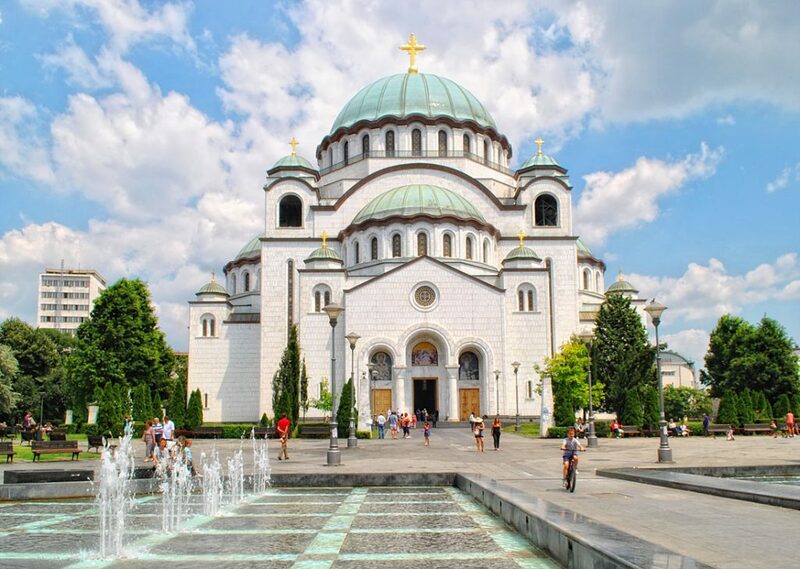 The church of Saint Sava, yet another reason to visit Belgrade. The former Yugoslav capital is home to one of the largest Orthodox churches in the entire world. Precisely, the church of Saint Sava is the second largest, first being in Saint Petersburg, Russia. Church of Saint Sava is an impressive sight, whether you’re an Orthodox Christian or not, this place is a must. This symbol of Belgrade is without a doubt one of the most amazing buildings in all of Balkans, which is a difficult title to obtain. You’ll see that it’s not only epic in size, but also magnificent as an overall experience. So, buckle up and get ready to learn a little something about its rich and complex history and also its existence in the former Yugoslavia. You’ll see there’s a reason Vogue Magazine called it Eastern Europe’s Sagrada Família! The church is dedicated to one of the most fascinating individuals in Serbian history – the founder of the Serbian church. Sava, born Rastko Nemanjić, was the son of the Serbian župan Stefan Nemanja. His fairytale-like life story is everything but boring. Even though he was destined to lead a life of riches and abundance, Rastko had a different idea in mind. What’s interesting is that, as a teenager, he gave up his crown and escaped at night to Greece’s Mt. Athos. There he became a monk, decided to live in modesty and accepted a new identity by taking the name Sava. Sava was remembered for dedicating his entire life to the Serbian church and people and their well-being. Now a little something about what you should expect when you get there. The church’s history is fairly long and turbulent. A lot of ups and downs and complex conditions got the church to the stage that it’s in today – magnificent, but still unfinished. Fortunately, the exterior was completed in 2004. The church’s facade is covered in smooth white marble and granite and topped with several copper domes. In case you’ve ever been to Istanbul, you might notice the similarity between this church and Hagia Sophia. Namely, the church is based on its architecture and also the Serbian Gračanica monastery. It’s built in the Serbian-Byzantine style. The church is in the very center of Belgrade, on the Vračar plateau. You should know that the spot the church’s in isn’t just a random location where they found enough space for such a grand building. There’s actually a lot of meaning behind it. To put it briefly, Serbia was under Turkish rule for around five centuries, during which Serbian people constantly tried to resist the occupation. In 1595, after an uprising in northern Serbia, Turkish grand vizier Koca Sinan Pasha decided to send a message to the Serbian people. As an act of cruelty, he asked for St. Sava’s relics to be transported to Belgrade from the Mileševa monastery. Then, he publicly burned them at the same spot where the church is located now. That brings even more meaning and sentimentality for Serbian Orthodox Christians. The church’s main dome is 134m high, topped with a 12m golden cross. There is also another 18 crosses on the smaller domes. Also, once the inside of the largest dome is decorated with the mosaic of Christ Pantocrator, each of his eyes will be 3m wide! There is 49 church bells in total. The biggest bell weighs a whooping 6 tons! Try to visit the church at noon to hear the longest bell ring of the day. At any time, the church can receive 10,000 people, which is often the case during the Christmas and Easter services. The construction board for the church was established in 1895, but the construction didn’t begin before 1935. Even after that, the road wasn’t at all smooth, since it was followed by World War II and then existence in Communist Yugoslavia. Only a couple of years after the beginning of construction, German forces bombed Belgrade in World War II. The work on the church was, of course, halted. In addition to that, one of the most humiliating things was the fact that Germans used the church as their storage space and their parking lot. However, even after Serbia was liberated, there was a new bump in the road – the Yugoslav Communists. They would actually end up stopping the construction for another 40 years, which is one of the reasons the church is still unfinished today. As you know, Communists were openly very anti-religion, since they firmly believed in Marx’s quote that “religion is opium of the people”. Therefore, after they came to power in Yugoslavia, they wouldn’t give the church building back to the church until 1984. The patriarch was so determined to win it back that he wrote to the authorities 88 times. However, there’s one internal section that is completely finished. 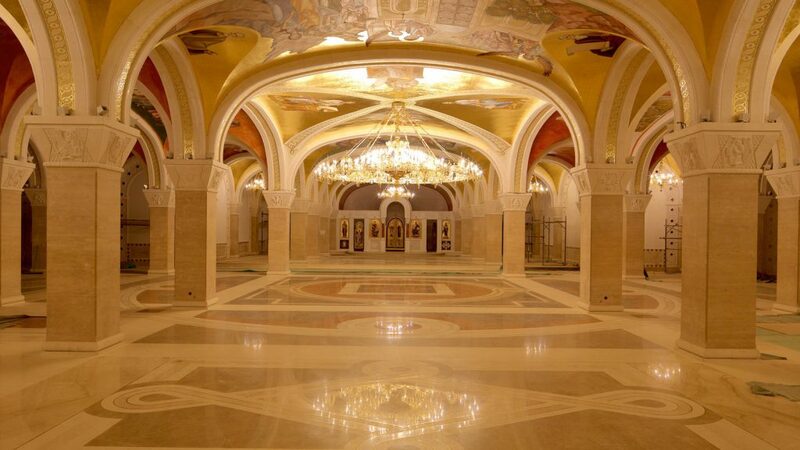 Get ready to be blown away by the 1800 m2 magnificent crypt located 7 meters below the actual church. Its walls are covered in hundreds of incredible frescoes and the ceiling is covered in gold and the most stunning chandeliers. Inside the crypt, you’ll be able to see the space reserved for the future graves of patriarchs. There are also plans to transform one section of the crypt into a concert hall of sorts, for religious music performances and gatherings. What’s incredibly meaningful is the fact that you can see the church’s original foundation stone is preserved and visible on the crypt’s ceiling. Even though the church is not finished yet, when you step inside it, you will be able to envision what it will look like in the end. It is said that in 8 years artists and construction workers will finish the entire inner decoration and, therefore, finalize the building. Until then, enjoy the majestic exterior and make sure to come back in 8 years to witness the completed masterpiece!